Connect the ULINK to the JTAG connector of the MCBXC866 Board. Note that the red cable marks pin 1 of the JTAG-connector. Make sure that the jumper J6 (BSL) is OFF. Power up the MCBXC866 Board. Configure Flash Programming in the Project Options for Target Utilities dialog. Click the toolbar button and select the Utilities tab. Set the Use Target Driver for Flash Programming option, then select the Infineon XC800 LINK Driver as the Flash programming tool. Check the Update Target before Debugging option to ensure that the Flash ROM gets programmed whenever the debugger starts. Click the Settings button to open the Flash Download Options dialog for the next step. Select Verify to verify the Flash contains the downloaded application. Click OK to accept the XC800 ULINK Driver Setup settings, then click OK again to store the Options for Target setting. Click the Download to Flash toolbar button. This executes the Flash download program (Target Driver or External) selected in Project — Options for Target — Utilities and downloads the application program into the XC800 device. Use the µVision command Flash — Download to download the application program into the XC800 device. 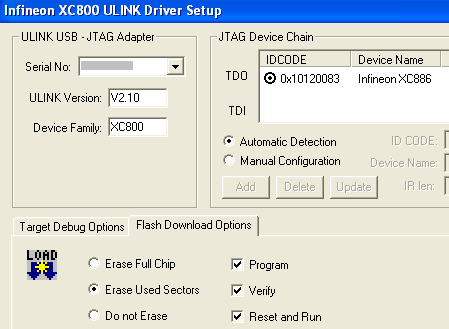 The ULINK-JTAG adapter can be also used for downloading and application code debugging in Flash ROM of the Infineon XC800 microcontroller.